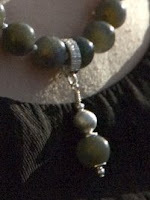 Enhancers are a fun way to ring the changes with a necklace. In late 07 I posted an "opulent orange" necklace; the person who received it as a gift returned it to be shortened and asked could the fire agate drop be removed and hung on a simple cord, in effect creating two necklaces for her. 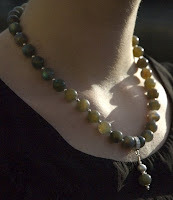 I thought of using vermeil enhancer clips that allowed the drop to be on or off the carnelian strand. 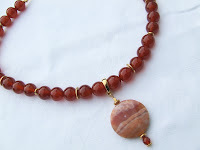 It inspired me to add a carnelian/vermeil strand with fire agate enhancer to my 2009 collection. 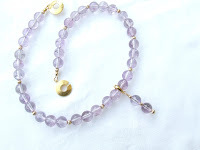 The delicate light violet colour of the cape amethyst goes nicely with a double drop enhancer. Grey-toned labradorite with that gorgeous blue flash and one large brushed silver bead can be worn as a classic strand, or for a longer line one can clip on the lovely silver and CZ enhancer, with labradorite and brushed silver drop. In much the same way, the vermeil enhancer with vermeil heart-shaped drop brings more length to a strand of jumbo-size natural peach pearls while adding extra wow factor. Definitely a year for flexibility!